In her film The Ghosts In Our Machine, director Liz Marshall illuminates the link between human lifestyle choices and the suffering of non-human animals. The film follows photographer Jo-Anne McArthur on her mission to document the lives of animals in the machines of our food, clothing, research, and amusement industries. Through McArthur’s eyes and heart, we experience the agony and the despair of animals living and dying in meat, dairy, and fur farms, and in laboratories and zoos. We also witness the joy and serendipity of animals who have escaped these machines to age happily on the Farm Sanctuary, the country’s largest farm animal rescue and protection centre. The Ghosts In Our Machine invites the viewer to take the first step on a long journey of “re-personizing” these ghosts. Marshall creates many moments of beautiful silence, leaving the audience in a quiet dialogue with powerful close-up shots of animal faces. The film gives the viewer room to draw their own conclusions – its moral imperative lies in-between-the-lines. The audience watches as a calf, Sonny, bonds with McArthur during his rescue from the dairy industry, running to greet her whenever she visits him at the Farm Sanctuary. Abby the beagle, a veteran of a research institution, instantly embraces her new parents – she seems to be able to distinguish between these new caregivers and the humans who abused her for years. Moments after having been gorily beaten, Julia the sow lovingly tends to her piglets – as much as her confinement permits. 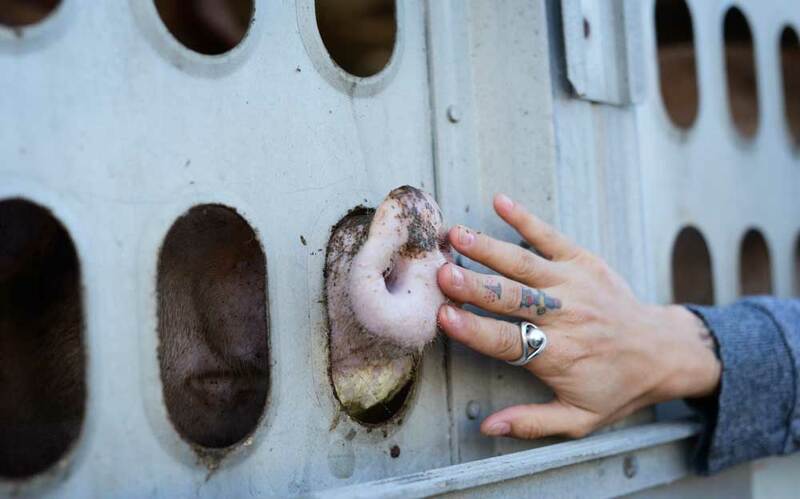 These pictures build a bridge that allows the viewer to transition from the common perspective of animals are others to the insight that this calf is a friend, this dog is a survivor, this sow is a mother – these animals are persons. Commentary from experts on animal sentience, animal intelligence, and animal personality place the film’s emotional moments into context. Science now confirms that animals feel gratitude and joy, solitude and relief, anguish and love. Animals reason about things meaningful to them. And they feel and reason in individually unique ways; no dolphin is like another, all sheep are different, and every fox has a unique experience of this world. Science sanctions a key intuition: animal personhood is no romantic notion, but a tangible reality. Marshall’s and McArthur’s fundamental vision is that we can find a new mode of relating to beyond-human beings. The power of this idea seems to transcend the film’s focus on animal suffering. The Ghosts In Our Machine extends an invitation to re-discover what it means to be human in the broader context of today’s environmental and ethical challenges. In the post-screening panel discussion at the Environmental Film Festival at Yale, Dr. Lori Gruen of Wesleyan University articulated this connection: the structures of exploitation of human and beyond-human beings are interlaced. The film is about animals. The underlying quest of justice is much broader. And in the midst of this challenge are you and I. In my time as a graduate student at the Yale School of Forestry and Environmental Studies (F&ES), I’ve watched as eminent figures in the environmental movement debate the challenges of ending factory farming, while enjoying factory-farmed bacon and chicken. Suggestions to “walk the talk” of environmental sustainability at F&ES, by offering only plant-based food at school events, are often shot down with reference to people’s disapproval. The human use, or abuse, of our fellow beings often goes unquestioned. We kind of know the impact that our daily glass of milk and or serving of chicken curry has on our fellow humans, on animals, and on nature. Yet, this lingering knowledge is far too troubling to be allowed to touch our full consciousness or conscience. The failure to link our daily lifestyle with the many ugly faces of meat and dairy production makes us the sponsors and beneficiaries of this industry’s impacts – deforestation, global warming, eutrophication, antibiotic resistance, and world hunger, to name a few. There are atrocious truths that we ignore, and therefore they persist. We will profit immensely from making ourselves aware of them, and by acting on our responsibility to change them by changing ourselves. We have the power to save our fellow beings – and ourselves – from becoming ghostified in the machine of our modern world. Rediscovering inherent value beyond the human can save us from the climate catastrophe, from environmental collapse, and from emotional pauperization. Through her example of empathy, McArthur helps us understand that cherishing animal personhood forms a powerful entryway into deconstructing the machine and into beginning an intimate dialogue with our wider world. In order to find our voice for this conversation, we need to reclaim our personal accountability for the past, present, and future of this planet. Edited by Amy Weinfurter and Noah Sokol. Uta Jürgens is a Special Student at the Yale School of Forestry & Environmental Studies and a PhD Candidate at the Swiss Federal Institute of Technology at Zürich, Switzerland. A psychologist by training, her research focuses on mending the relationship between humans and their fellow world. Uta also explores compassionate coexistence from a practical perspective: her advocacy projects include a contribution to the fur-free movement and advocacy for human-wildlife coexistence in central Europe. She can be reached at utaj@student.ethz.ch. Well, said! Let us unite to deconstruct the machine!